It takes a tremendous amount of energy to manufacture and power our devices, data centres, and related infrastructural needs. The energy footprint of the IT sector is already estimated to consume approximately 7% of global electricity. With an anticipated threefold increase in global internet traffic by 2020, the internet’s energy footprint is expected to rise further, fueled both by our individual consumption of data and by the spread of the digital age to more of the world’s population, from 3 billion to over 4 billion globally. 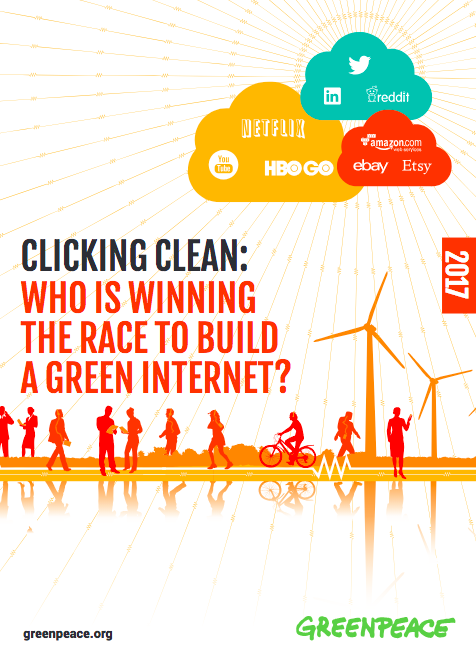 In light of the sector’s pivotal role, Greenpeace began benchmarking the energy performance of the IT sector in 2009, challenging those companies who are the largest global architects and operators of the internet to commit to powering their rapid growth with 100% renewable energy. Leaders from Facebook to Google have already committed, who will be next? Here you can read all the findings of Greenpeace study, published in 2017.